As a part of the parish program, Holy Trinity teachers prepare students through the Sacramental Program. There are seven holy Sacraments, three of which are celebrated during a child’s primary school years. A Sacrament is a special sign of God’s presence. Sacraments are God’s gift to the church and it is through these Sacraments that we fully become members of God’s family. Preparation for the Sacraments of Penance (Reconciliation), Eucharist (First Holy Communion) and Confirmation is a partnership between the school and the family. 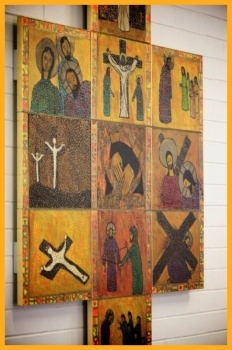 While preparation for these Sacraments is school based, there is an expectation that parents play an active part in this preparation by attending sacramental information nights, commitment masses and sacramental workshops. By his death on the cross, Jesus Christ redeemed man from sin. The Sacrament of Reconciliation restores life to the soul through forgiveness of our sins after baptism. Through Reconciliation, we come to God to receive healing in our lives and in our relationships. When preparing for the Sacrament of Reconciliation, the starting point is exploring the child’s own relationships. The children reflect on their own family and friendship experiences, the happy and the hurtful times. We explore the rituals of making up or ‘reconciliation’ and the ways of making peace again when things go wrong. From this starting point, we then look at the wider church family. We reflect on the Gospel’s insights of a God who seeks out those who feel hurt or are the cause of hurt in others and we explore the elements of the Rite of Reconciliation. The children celebrate the Sacrament of Reconciliation with their families at a special ceremony in our church. Eucharist is a Christian community celebration and one of the three Sacraments of Initiation. Students celebrate their First Eucharist when they are in Year 3. It is a special event for families and an ongoing Sacrament celebrated with our Parish and school family at Mass. 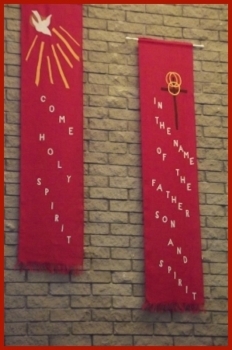 Confirmation is one of the Holy Sacraments. It is a process that begins at Baptism. Through this sacrament, Christians are strengthened by the Holy Spirit to use and develop their gifts to love and serve God and others in our everyday lives. Confirmation is celebrated at a special ceremony in our church, officiated by the Bishop and our Parish Priest. During the Confirmation ceremony, the Bishop annoints the sacred oil of chrism on the forehead of each nominee. With the laying of the hands, the candidates are then invited to go out into the world, just as the Apostles did, with the Holy Spirit in their hearts. When preparing for the sacrament, students reflect on the fruits of the Holy Spirit by investigating the lives of saints and people in the community. 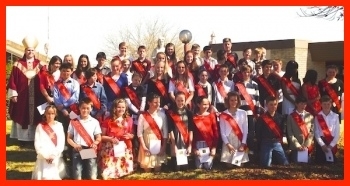 Then, at Confirmation, they accept the challenge and responsibility of nurturing God’s gifts to the world.